Over the weekend, the Department of Homeland Security issued a warning that there was a “specific, credible, yet unconfirmed” threat of a “terrorist” attack in New York and Washington D.C.. This is the permanent state of things on the U.S.-Mexico border. The 10th anniversary of 9/11 has produced many reports that speak to this reality. Over the weekend, the Department of Homelands Security (DHS) issued a warning that there was a “specific, credible, yet unconfirmed” threat of a “terrorist” attack in New York and Washington D.C. 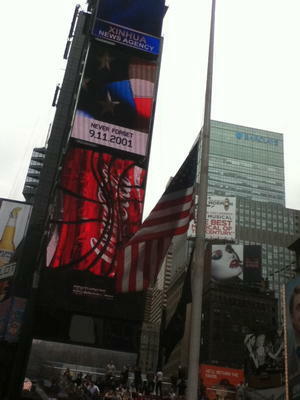 In New York City everything became hyped-up and the security apparatus came out full throttle. After seeing the roving Counterterrorism unit of the NYPD on the streets clad with combat helmets, bullet-proof vests, and carrying long automatic firearms, I wondered if this were the permanent state of things in the country, if there were always a “specific, credible, yet unconfirmed threat.” This feeling is particularly sharp on the U.S.-Mexico border where the border enforcement apparatus escalated its presence dramatically after 9/11, building off strategies it began in the mid-1990s. 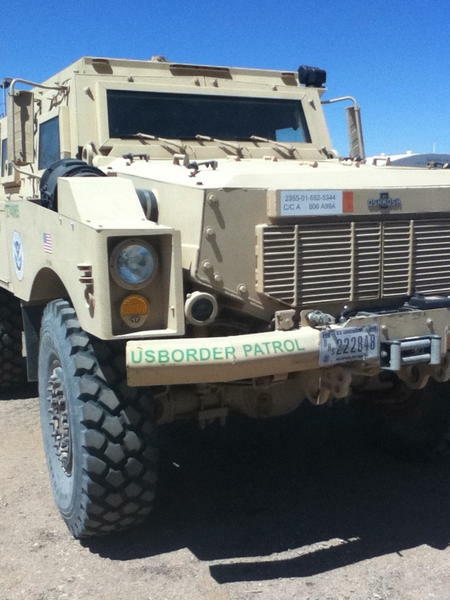 Yes, there actually is a Border Patrol tank. Both Barry’s critique and Bassett’s quote encapsulate much of the information present in the many “homeland” and “border security” reports produced for the 10th anniversary of 9/11—"Policy on the Edge" being but one. One great thing about the anniversary is the quantity of information it produced. What follows is my attempt to synthesize some of the information offered in these reports, to provide links, and offer some research data. Of the many wars that the September 2001 attacks spawned, oddly one of the least paid attention to is the escalation of militarization on the U.S.-Mexico border. Here is how bad it's become. Some 1,271 government organizations and 1,931 private companies work on programs related to counterterrorism, homeland security, and intelligence in about 10,000 locations across the United States. In other words, this thing is huge, confusing, and an employment juggernaut. Undoubtedly this “amorphous” world contains many facets of the border/immigration enforcement apparatus. Between 2002 and 2010 Homeland Security spending went up from $19.5 billion to $55.3 billion. And this was through a recession. From 2004 to 2010 DHS personnel increased from 181,875 to 230,000. This figure doesn’t include those employed under contracts that the report estimates (maybe even conservatively) to be 200,000, almost the amount of employees in the department itself. In 2010 the $11.5 billion budget of Customs and Border Protection (CBP), an agency within DHS that includes the Border Patrol, is more than double the $5 billion allocated in 2002. Employment in CBP has increased by more than 40%, from 41,000 in 2004 to 58,575 in 2010. And all signs point to a continuation of this increase. Within CBP the Border Patrol has been growing at even a faster clip. In 2010 Border Patrol had 20,558 agents, more than double the approximately 10,000 agents in 2005. The Immigration and Customs Enforcement (ICE) budget more than doubled between 2002 and 2010—from $2.4 billion to $5.74 billion. ICE, of course, is in charge of domestic immigration enforcement. Their employment has increased from 14,410 in 2004 to 20,134 in 2010. The Homeland Security Act of 2002 tasked the newly formed DHS with achieving “effective control of U.S. borders,” and the expansion of a “zone of security” beyond U.S. borders. I wonder how historians will view this. The Secure Border Initiative - a 2005 policy framework that is still in effect whose goal is “operational control of the border” through a combination of fencing and technology. SBInet was the $30 billion tech branch of this. Although DHS cancelled this program when they contracted out to the Boeing corporation in January 2011, a new version to create the so-called “virtual fence” is in the works, and companies These chairs represented the almost 3,000 killed on 9/11, many of them immigrants. are salivating at the possibilities of contracts (see the next report below). The Secure Fence Act of 2006, which still continues, mandates the construction of 700 miles of fencing on the southern border. The REAL ID Act of 2005 wasn’t just about driver’s licenses and identification cards, it also said that DHS can waive any laws to ensure the expedited construction of “barriers and roads” along the border. Deportations have increased 134% from 165,168 deported in 2002 to 387,242 deported in 2010. Which, of course, continues to increase—see these previous blog postings. Detainees have increased from 202,000 in 2002 to 363,064 in 2010. The average daily detainee population has increased from 19,922 to 31,020. FLIR Systems – a world leader in thermal infrared sensors. And there are plenty more companies jumping on the Homeland Security bandwagon. In memory of Carlos La Madrid, killed by the U.S. Border Patrol in March 2011. All these reports point to one thing—there is either claim of, or an allusion to, a “specific, credible, yet unconfirmed” threat. This has become the permanent state of affairs on the southern border. Perhaps all of this might have as much substance as Department of Homeland Security Cologne. Read more of NACLA's Border War blog at nacla.org/blog/border-wars, and follow it on twitter, @NACLABorderWars.